I bought this box of Trader Joe’s Dark Chocolate Caramallows last week. I was super excited to think that I’d caught a new product that resembled my beloved See’s Scotchmallows, but it turns out that they were around last year as well. 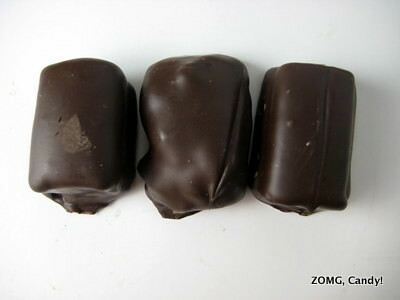 The long, skinny box described them as “pillowy marshmallow bites with a layer of rich, silky caramel, enrobed in dark chocolate.” There were 10 Caramallows in the box all lined up in a row. While most were rectangular with a vertical line across them, some were more irregularly shaped. 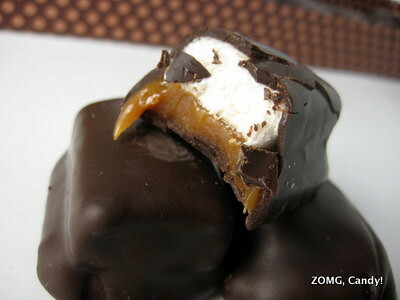 Each had a bottom layer of caramel topped with a square of marshmallow and all covered in a dark chocolate shell. The Caramallows were far softer than Scotchmallows and squishily yielded to my bite. 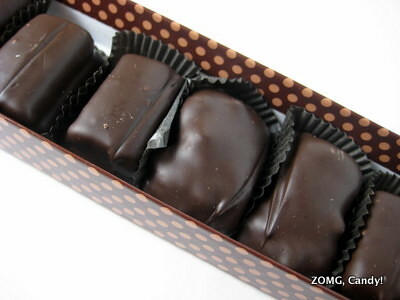 The dark chocolate shell was quite nice, a high quality chocolate that was lightly sweet with a fruity finish. The bottom layer of caramel was softy chewy and sticky. It tasted sweetly buttery rather than scorchy or burnt, and it had a mild butterscotchy flavor. The marshmallow was squishy and foamy in texture. It had a sweetly mild flavor with a light vanilla airiness. These were tasty enough, but they aren’t a suitable Scotchmallow replacement. The fact that they were so soft throughout made them seem insubstantial compared to Scotchmallows, and Scotchmallows have much more complexity of flavor. An OM. History of Candy Canes: Why Do They Look Like That?